heart of home Archives - Pebbles, Inc.
Hello friends it’s Lucile ! Today I find you for a new project ! 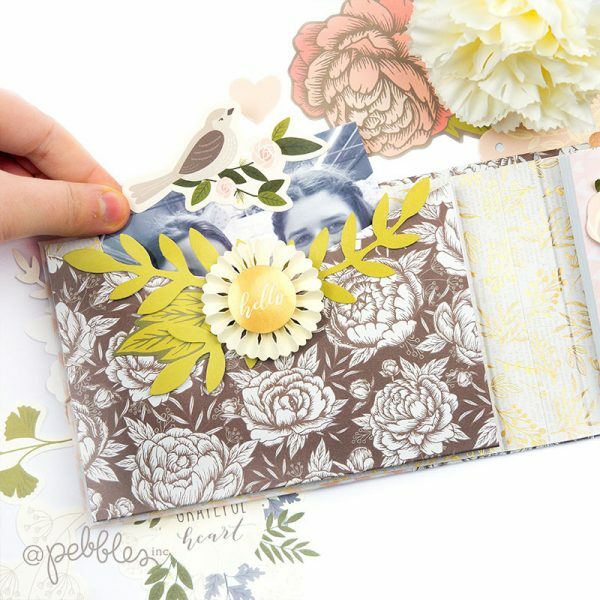 I suggest you make a mini album with pockets to organize your memories of spring. 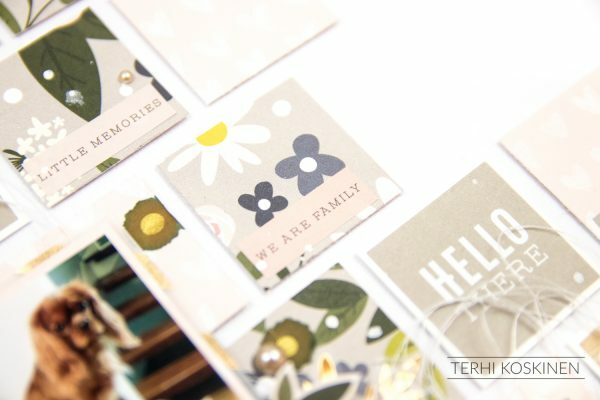 To make this mini album I used the collection “Heart Of Home” by Jen Hadfield. You can find the video of the complete tutorial at the end of the article. To make the cover I used cardboard. Then I covered it with different papers from the collection. I wanted to make the slice with a different paper. I decorated it with stickers and die cuts. I ended up adding my title to the slice. Inside I started by creating a pocket with four compartments: one for each month. I used four envelopes that I stuck together. I then covered the front of my pocket with a paper and I created another cover to slip a tag. I ended up decorating with die cuts and stickers. I created tabs with a punch and attached them to my photos to catch them easily in the pockets. For the left part, I created a larger pocket. I cut the top so I could slide things in more easily. I decorated it with several embellishments of the collection. 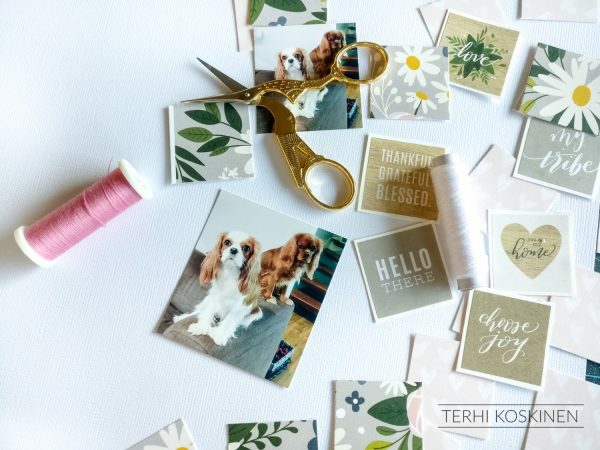 I hope you enjoyed this tutorial and that it will help you organize your photos. We meet again very soon for a new realization ! Before we get to the end of the week, we have to share some exciting news! 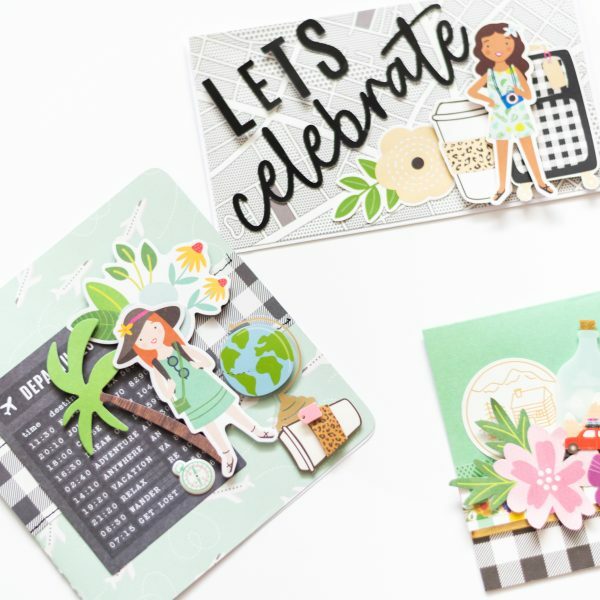 Have you heard about the Designer Destination section at Jo-Ann Stores? It is brand new – and our very own Jen Hadfield has 2 lines in it (along with Damask Love, Paige Evans, Shimelle and Maggie Holmes!)! What does this mean? 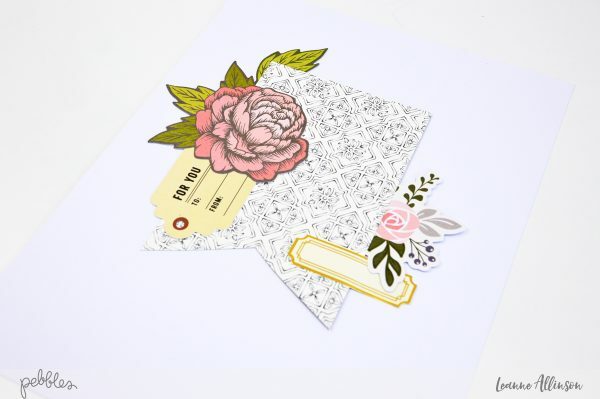 This means you can find single sheets of double-sided prints, a 12×12 project pad, paper pad, cards and a small variety of embellishments (and more!) 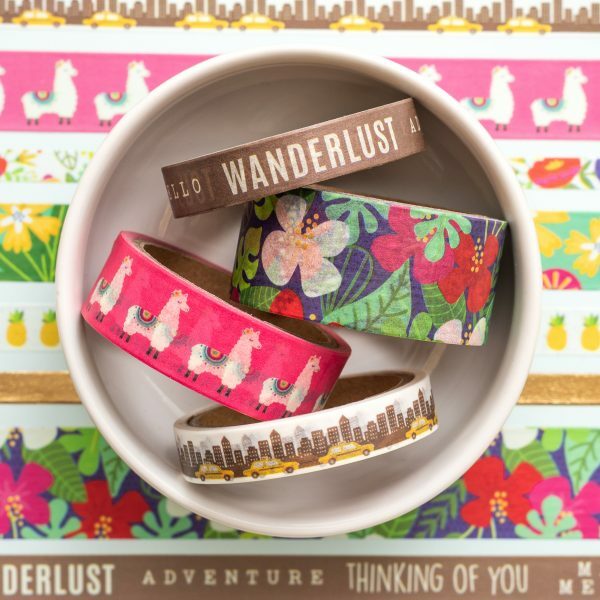 from the Heart of Home Collection as well as the newest Chasing Adventures Collection. This same type of assortment is found in the other collections as well! We feel so blessed to be in a large segment of Jo-Ann Stores! Click here for the complete list. Let us know if you like what you see there either on social media or via email (Please send email correspondence to pbsocial@americancrafts.com). Just between us – if this performs well, we could get more collections like these available to you in more places, big AND small! These products will be in stores within the next week and available to purchase online soon after! Be sure to check them out! 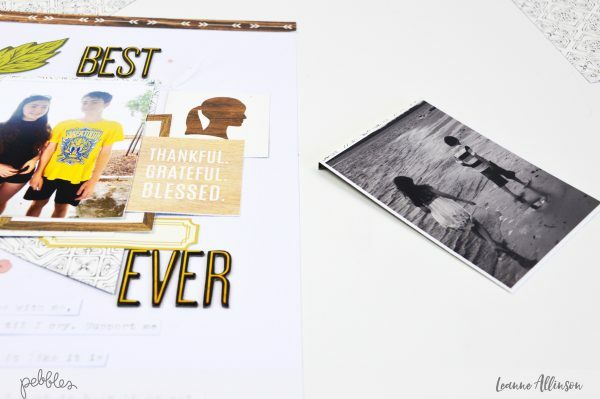 Create a Best Friends layout with a timeline twist! Hello Pebbles Friends! 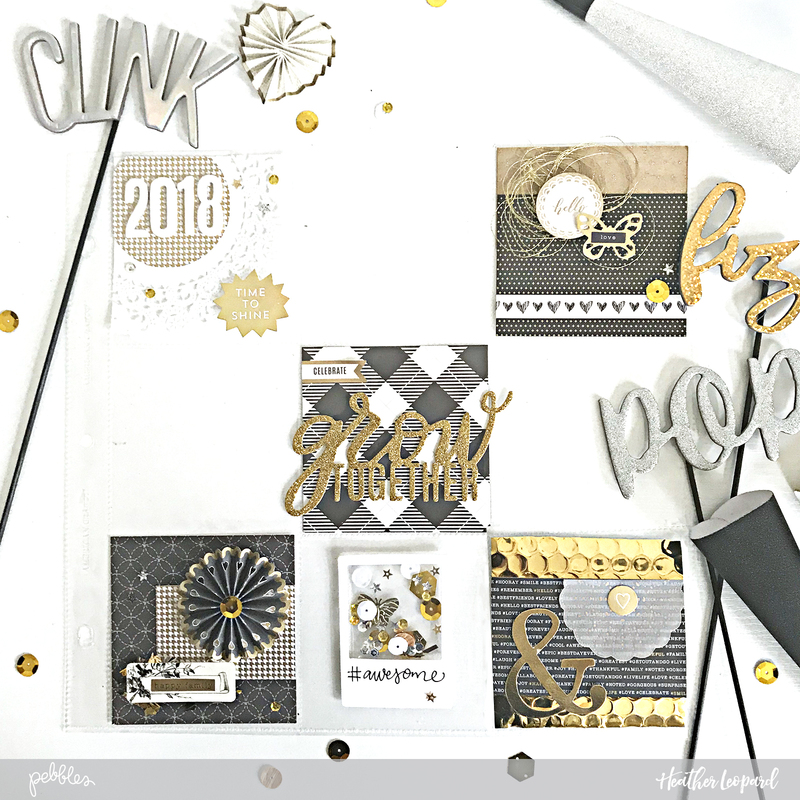 It’s Leanne here today sharing a Best Friends layout with a timeline twist! What’s that? I hear you ask, well think of it as a layout with a hidden photo journey element. 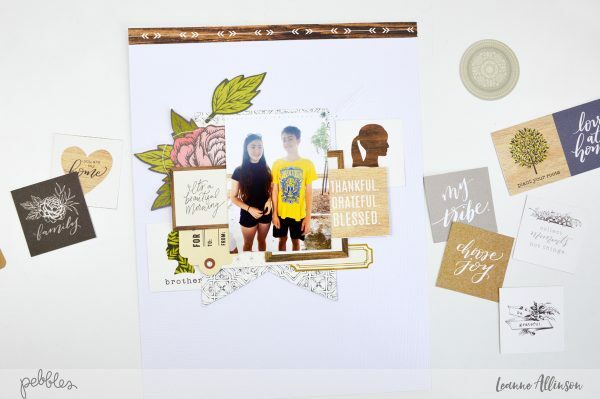 And just like a Best Friend, this layout is full of fun surprises! 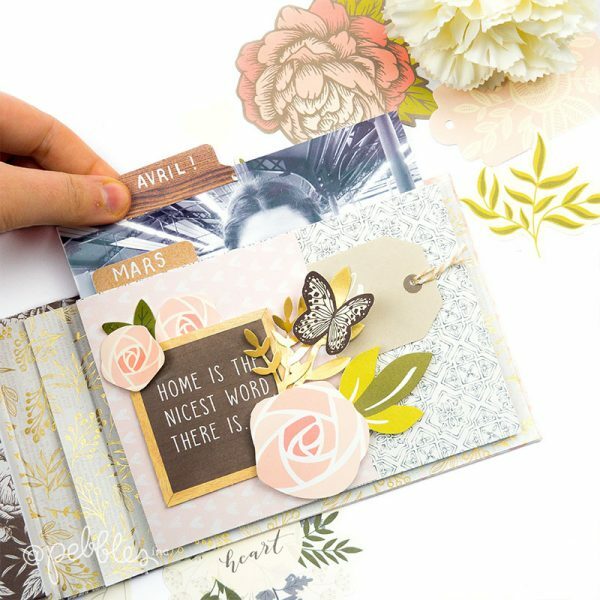 To recreate this page, gather supplies that have a similar colour tone palette. 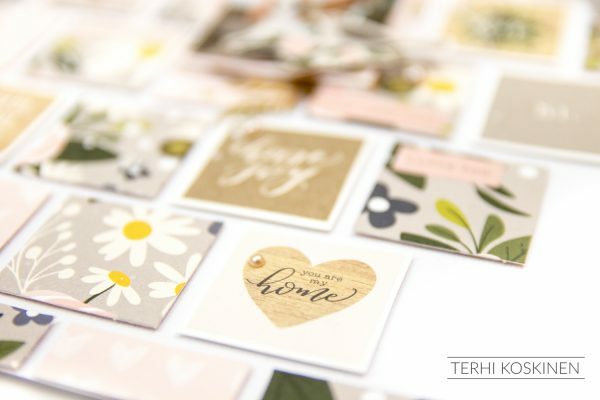 I am using the gorgeous Jen Hadfield Heart of Home collection. 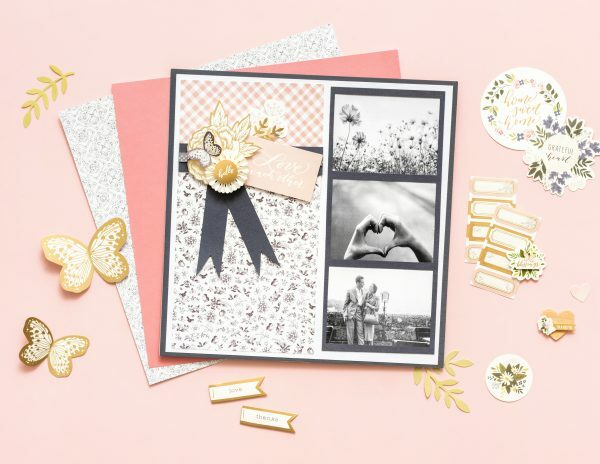 The idea to use this type of colour scheme is to allow and build intricate layers to provide a patterned paper story to compliment the photos. This layout will require the use of two photos. To recreate a timeline, print an early photo of your subject along with a later one. The photos I have used are of my two eldest children. The photo that is visible is one of them at ages three & five. The hidden photo was taken when they were thirteen & fifteen. step 1. 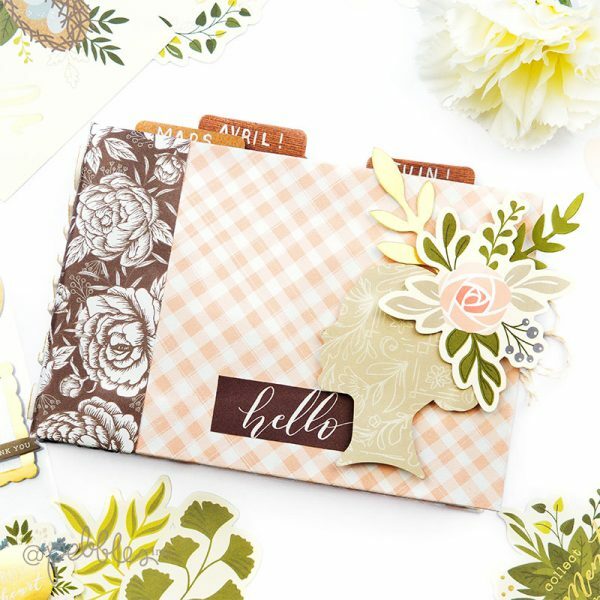 This patterned paper collection has been brought together and grounded with a simple white cardstock background. 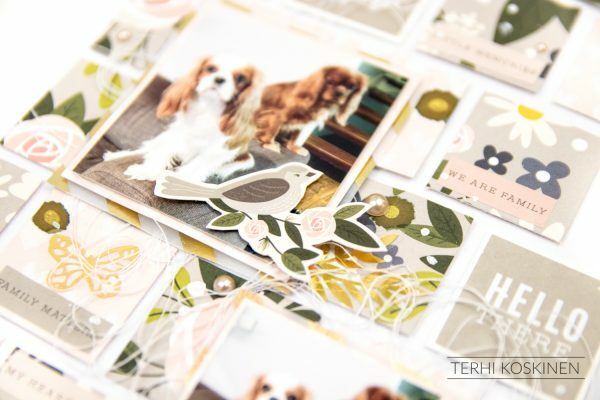 Trim the cardstock to size and select any die cut ephemera you wish to include. step 2. Take note of the photo measurement and create a banner flag, slightly larger than the photo, with patterned paper. Machine stitch the banner directly to the cardstock for some textural dimension. Leave the ends of the thread slightly long. step 3. 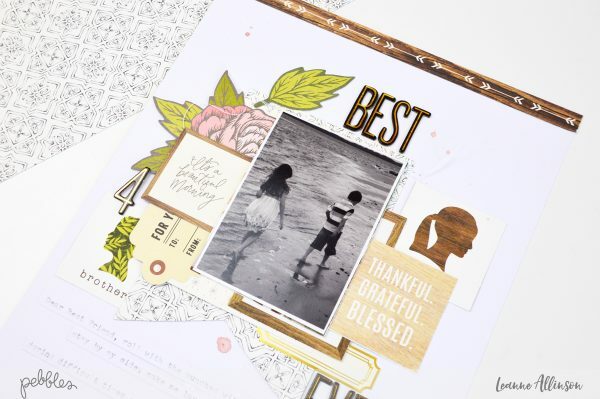 A paper strip has been added to the top of the Best Friends layout page. 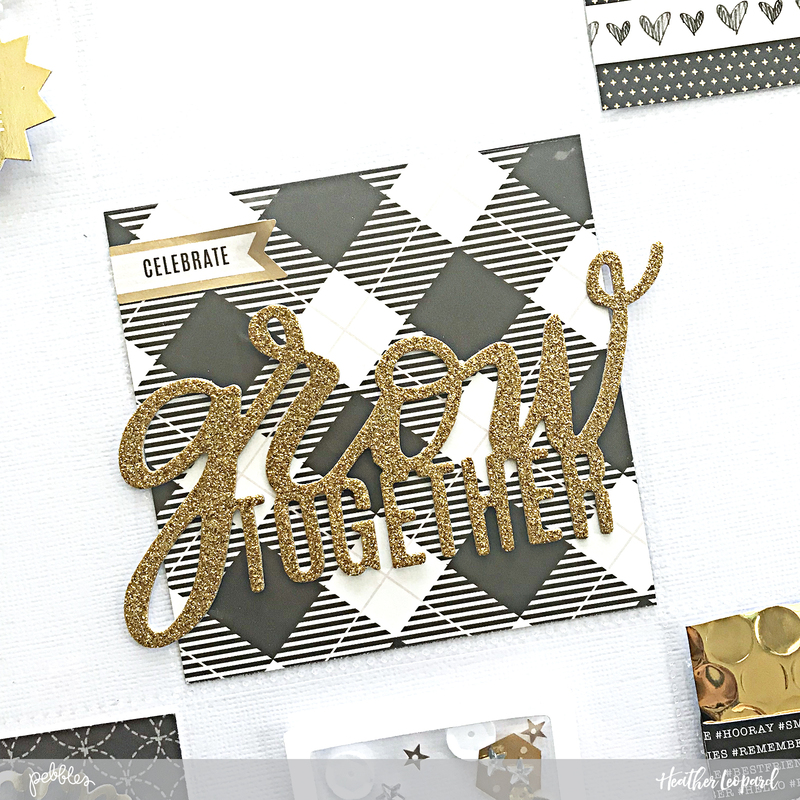 Continue adding patterned paper and die cut elements overlapping the banner. 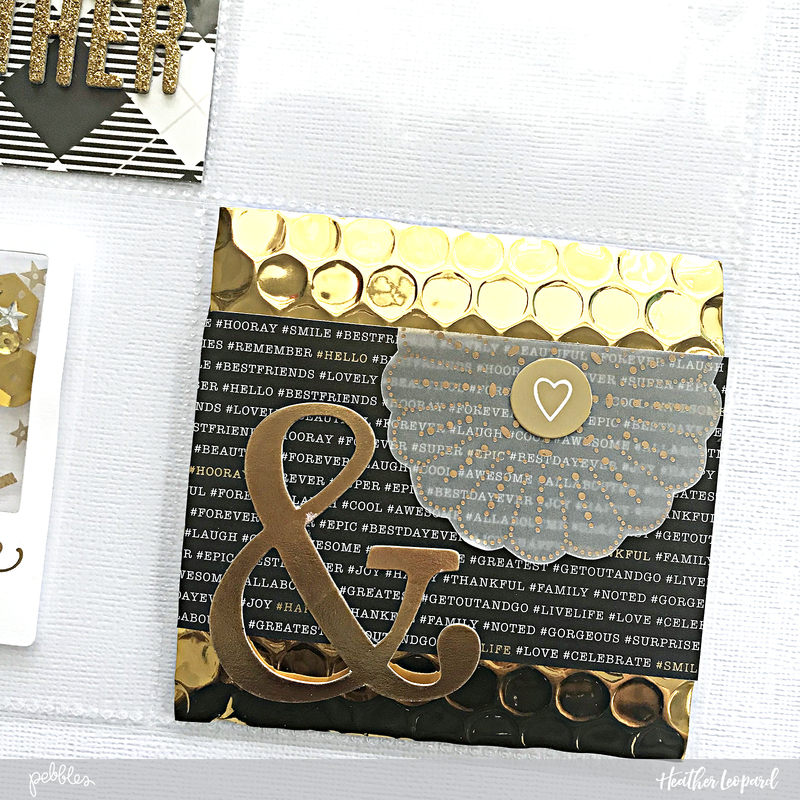 I’ve also included Heart of Home Gold Foil accent label stickers for extra interest. step 4. 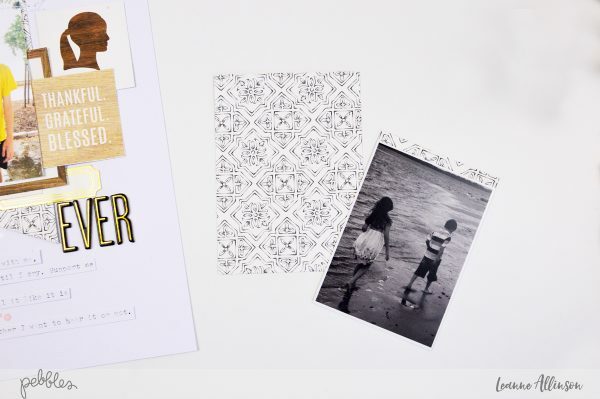 Place the first photo, the one that will be hidden from immediate view, onto the built up patterned paper layers. Machine stitch another row of white thread across the top to help secure it in place. step 5. Next, I have taken inspiration from the Heart of Home Love at Home patterned paper and trimmed the 2″x2″ squares from the sheet. step 6. These squares, especially the “brother”/”sister” paper pieces were layered between the existing patterned papers already on the cardstock. step 7. 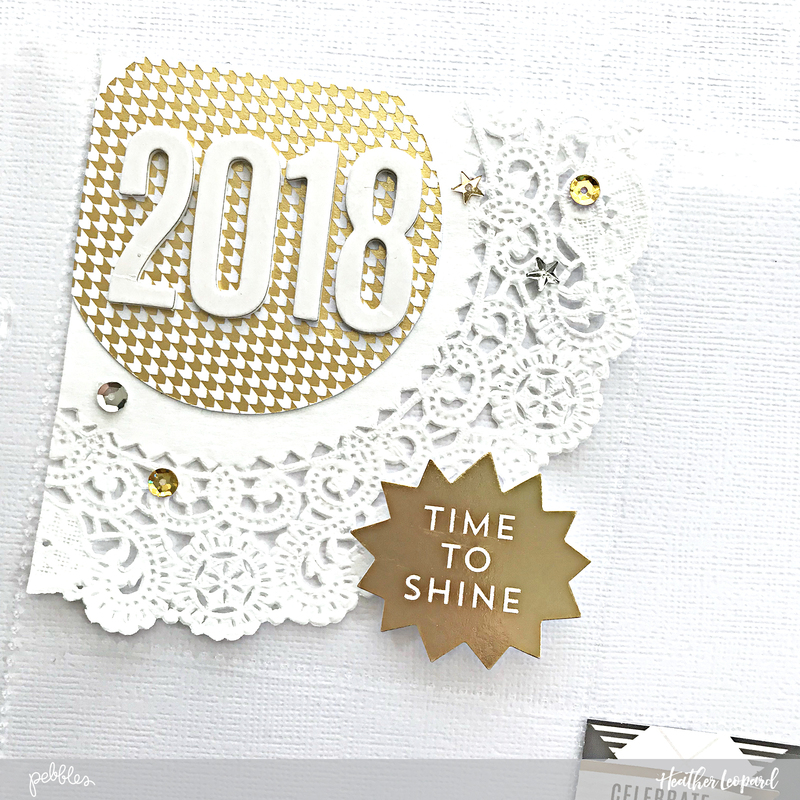 Add a title using coordinating Printed Foil Letter Stickers. Place the alphas to create a visual triangle across the page. Using words such as Best Friends or Forever, can clearly help relay the story message. step 8. 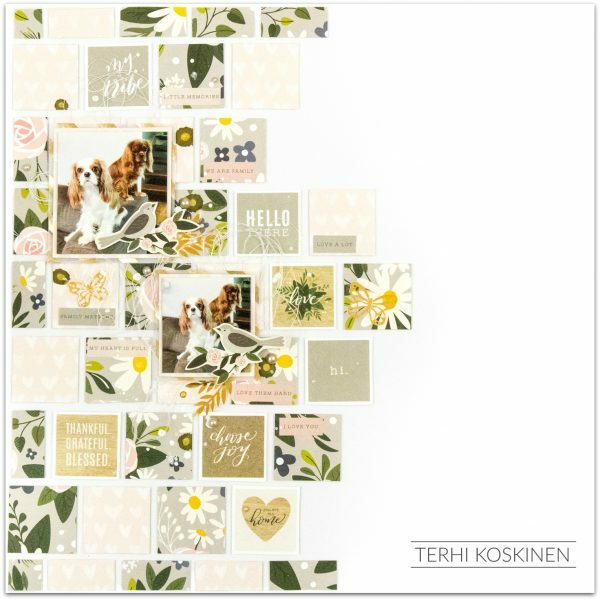 Before adding journaling strips, splash some Heidi Swapp color shine in coordinating colours directly to the layout and allow to dry. More splashes at the bottom of the page helps balance the white space within the layout format. step 9. 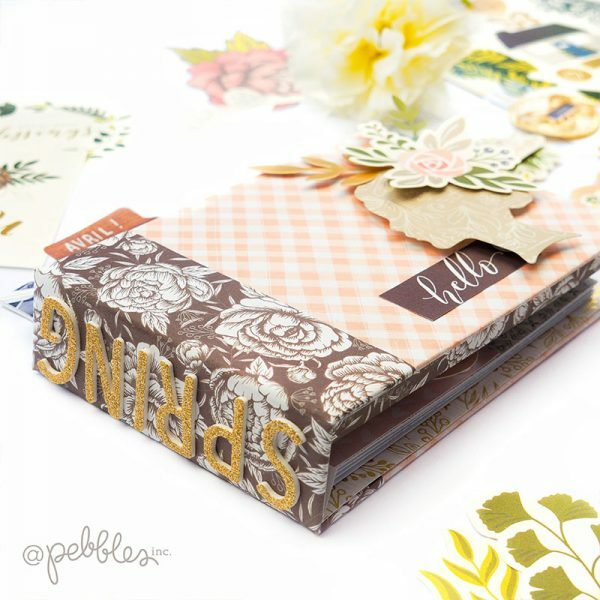 Type your journaling, cut into strips and adhere at the bottom of the layout. If you wanted to, your Best Friends layout would be perfectly fine if you made the last step your final one. However, for a more interactive and sensational layout, securing another photo to the top of first one, creates a special surprise! step 10. Choose a black and white photo, the same size as the original photo. 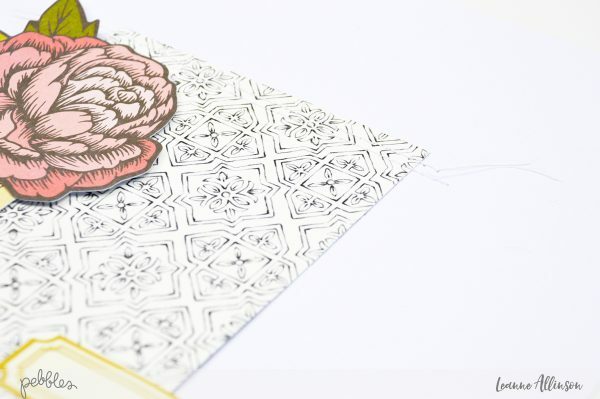 The black and white photo will help blend in with the existing patterned papers. step 11. Trim a piece of patterned paper, the same as the banner flag created at the beginning of this tutorial, to the same width as the photo. Allow the length of the patterned paper to extend slightly past the top of the image. Adhere the patterned paper to the photo. step 12. 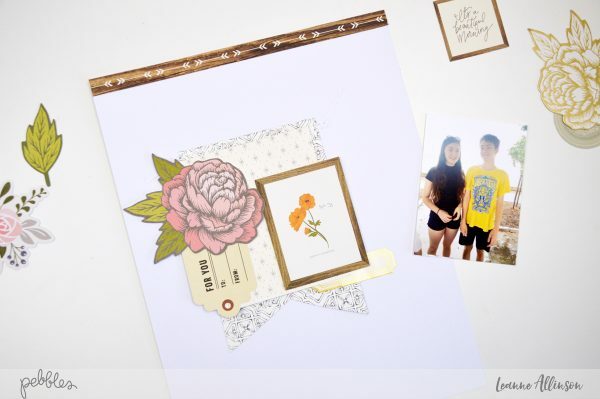 Score a fold line along the top edge of the photo and patterned paper to create a tab. Using double sided adhesive, secure to the top of the photo already on the layout. step 13. 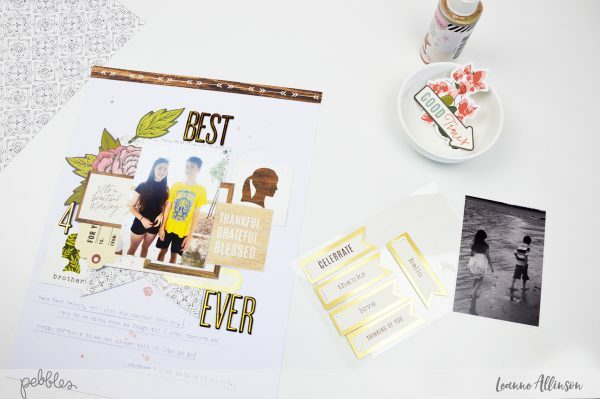 Optional extras to complete the layout, can include more personal journaling or another photo to add to the visual timeline. Thanks for visiting the Pebbles blog today. I hope I have inspired you to create a fun, but effective Best Friends layout. 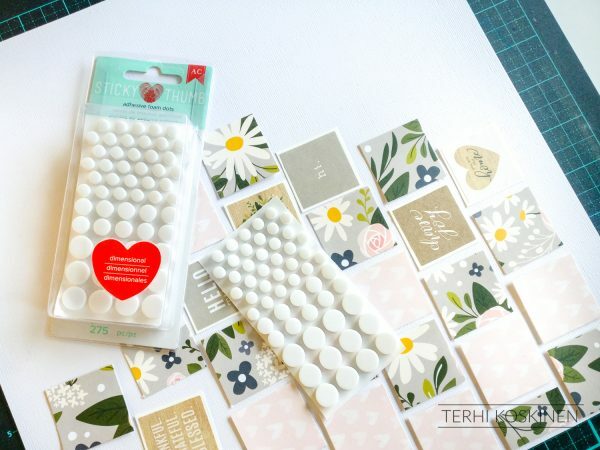 Hello Pebbles Fans, Terhi Koskinen here with some sticker inspiration! 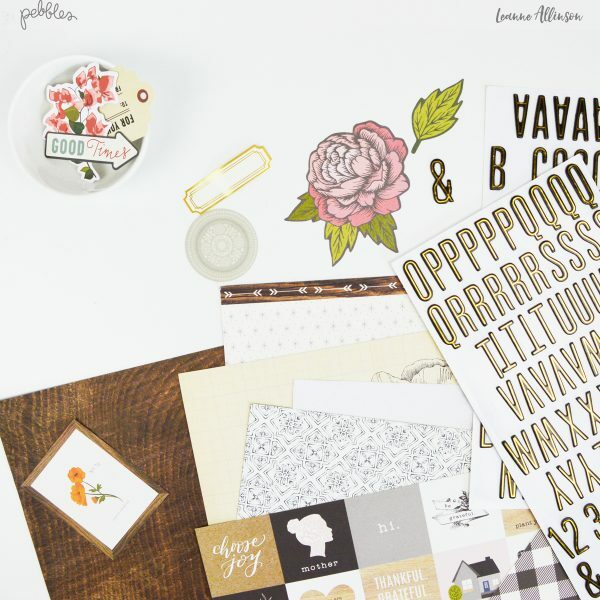 Do you remember the beautiful Designer Sticker Books released last fall? 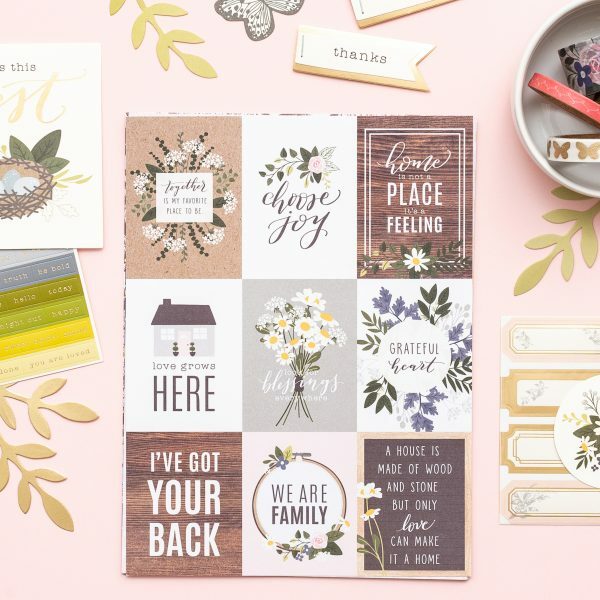 I used the Jen Hadfield one, which is definitely my favorite with all the flowers, phrases, frames, flourishes and much more. 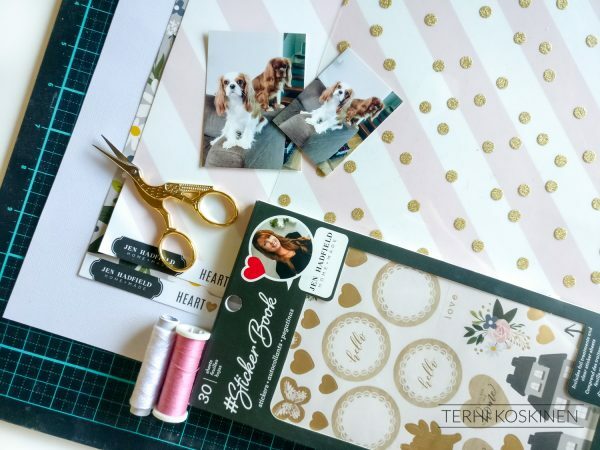 This layout is created with only the stickers, thread and patterned papers, easy and quick to do so hope you’ll love as much as I. Start with choosing the papers to go with. Mine’s from Heart of Home collection, matching perfectly to Jen’s stickers. Then cut small squares using scissors or paper trimmer, which ever you prefer. The squares you see on my layout are just thin line bigger than the square stickers in the sticker book. I rarely measure anything on my pages, it’s much more fun to go with the flow. 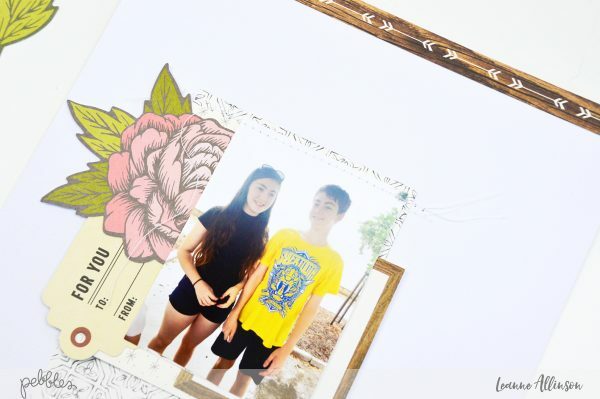 Create the background for the page by adding the squares one by one, using Adhesive Foam Dots. 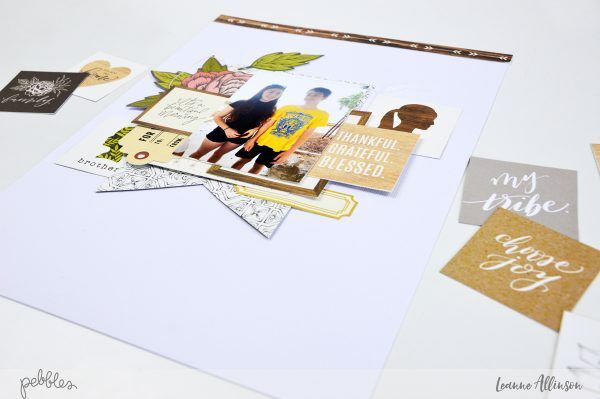 Using foam, instead or glue, you’ll receive some dimension for your background but still the layout is easy to add into page protector and album. 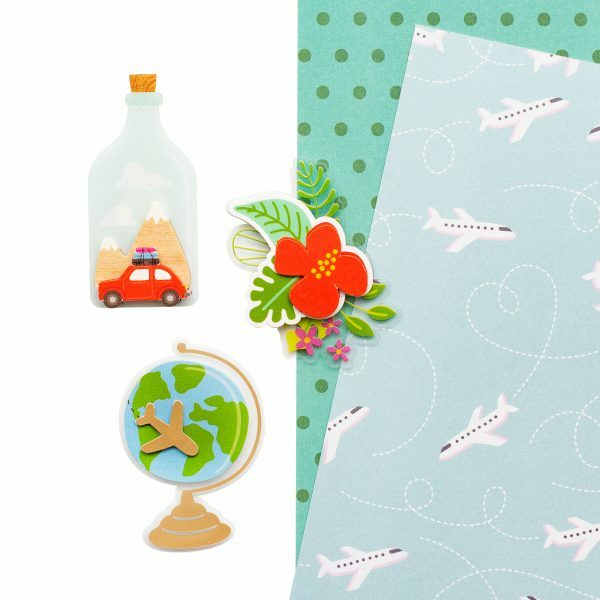 Once you have the background ready, just add the photographs on top, and decorate the scrapbook page with stickers from the sticker book. I chose to use similar flowers and leaves as is on the background squares, and matching phrases. This creating process was so easy and quick to do!